Yes, NehaDupia is pregnant and husband AngadBedi announced the big news with adorable photos on Instagram. On Friday, Angad posted monochrome photos with his wife NehaDhupia, where the actress’ baby bump is visible. Angad captioned the post: “Ha! Turns out this rumor is true. 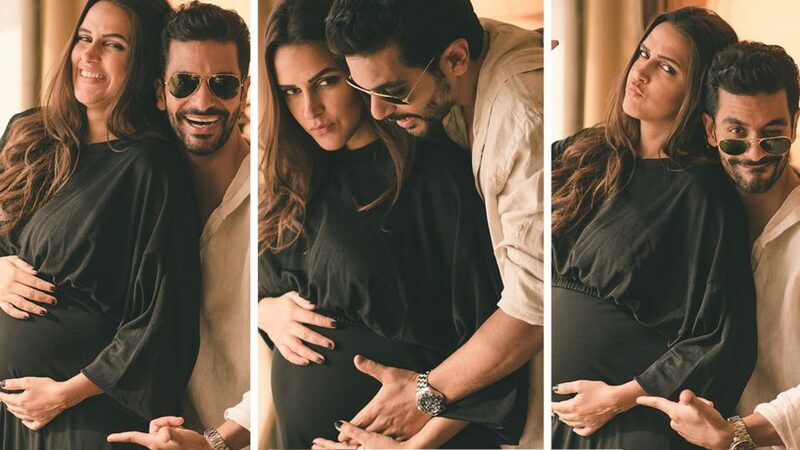 Three of us.”NehaDhupia also Instagrammed her pregnancy photos on her respective social media account and wrote: “Here’s to new beginnings.” The comment section is flooded with congratulatory words. MalaikaArora and SonakshiSinha also left their precious comments on NehaDhupia’s post. Neha and Angad got married in a hush-hush ceremony in May this year. They later announced their wedding with similar posts on social media. Karan Johar, who also made their wedding announcement on his social media profile, congratulated the couple with an Instagram post. “Being a parent is such a blessing….congratulations to the gorgeous couple NehaDhupia and AngadBedi on the beginning of another beautiful love story,” Karan Johar’s post read. NehaDhupia and AngadBedi’s wedding was an intimate ceremony, which was attended by family’s close associates. Fans of gossip columns had any clue that Neha and Angad were getting married in a Delhi gurudwara on the afternoon of May 10.